Our yuccas have been planted for over four years now, maturing very well and reaching heights about 2 meters. They have a very large trunk, which produces new yuccas all the time. I then let the new growth grow to about 1 meter before using them in other parts of the garden, which has worked well. My concern is the trunk is very big. How big are the roots, as we have it in a garden bed with a retaining wall? Also, should I cut back the mature yucca? 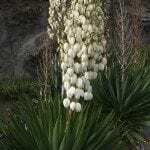 Whether you cut back the mature yucca is up to you. They do not need it, but it will not hurt them. In terms of the retaining wall, there is a chance that the roots could damage the wall in future. It really just depends on how much space the roots have. Walls and foundations are no different than pots to a plant. If the plant runs out of room for the roots to grow, it will push against the walls of its containment, be it a pot or a wall, and try to make room. You may want to dig a small hole on the yucca side of the wall once a year or so to check if the roots have reached it yet. If they have, you can try root pruning the plant to control the roots.